NYS Office of Professions Entangled with Alcoholics Anonymous? My initial complaint to the Office of Professions was less than satisfying, and I tried to get some information about what the Office of Professions did to investigate. But then I also found out that 12-steppers can pretty much ruin the career of anyone who wants to complain about this. 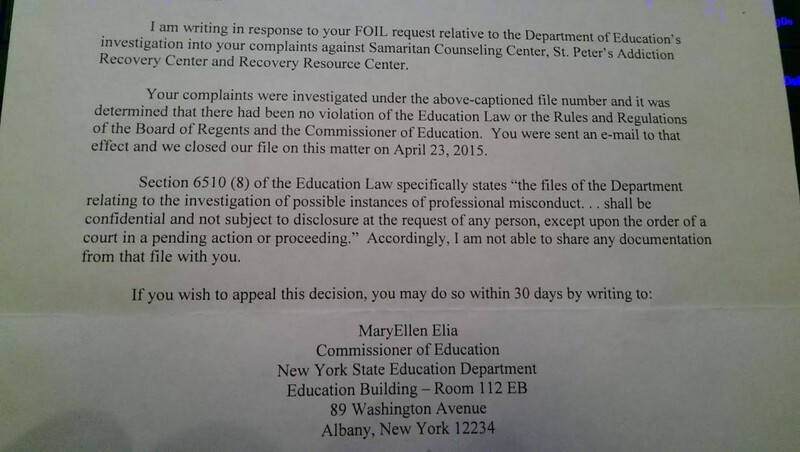 I sent a petition of over 140 signatures and 9 letters to the Commissioner of Education of NY, NASW, Samaritan Counseling, Samaritan Institute, and the Department of Health and Human Services of NY, and have received no response from anybody.